The vibrant desert city of Las Vegas is home to about 629,000 residents, making it by far the largest city in the state of Nevada. This population is served by full-service mortuaries, including the traditional amenities of a chapel, cemetery, memorial gardens, mausoleums, and cremation services. Other Las Vegas funeral homes may offer more extended choices for final disposition such as columbariums, scattering grounds, or private burial grounds. Like the rest of the U.S., Christianity is the dominant religion in Las Vegas, with Catholicism the most common denomination. Latter-day Saints also have a significant presence within the city, with an estimated 6.5 per cent of Las Vegans following this Church. While Judaism and Islam are less common than in the U.S. overall, Eastern religions are more prevalent, as well as people who do not identify as having any religious affiliation. This diversity means that Las Vegas funeral homes may have extensive experience serving bereaved families and individuals from a variety of religious and cultural backgrounds, as well as providing secular or Humanist services. Event centers such as Ron Decar’s situated on the Las Vegas Strip and Doolittle Community Center located in West Las Vegas are among the many non-religious venues that welcome memorial services. Be aware that funerals in Las Vegas are governed by Nevada state law, which has stricter requirements than some other U.S. states. Embalming is legally required by the Nevada Board of Health if the death was due to a communicable disease (i.e. a disease that is transmitted by direct or indirect contact), or if the body is to be transported. Whatever you choose for your loved one’s final farewell, funeral directors in Las Vegas are flexible and work diligently with families to provide the memorial services of their choice. 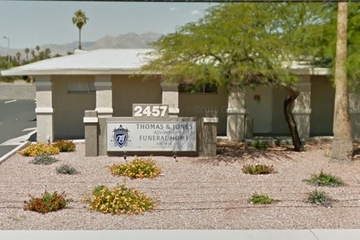 Search by area or ZIP code now to find funeral homes in Las Vegas near you. You can order results by best rated, most reviewed or nearest, and click on a funeral home’s profile to find out more. You can read customer reviews, discover more about the services they provide, and get in touch to begin making funeral arrangements for your loved one.